Michael Chesbro's Wilderness Evasion puts a different twist on survival in the wilderness, in that the assumption is that you do not want to be found rather than the usual focus on signaling for help or finding your way out of a wild place on your own. 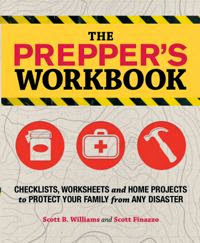 In this respect, it is perhaps the one survival book on the market most similar to my own forthcoming book: Bug Out: The Complete Plan for Escaping a Catastrophic Disaster Before It's Too Late. Chesbro's book was published in 2002, by Paladin Press, quite awhile before the current surge in popularity of survival and prepardness topics. 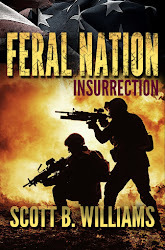 The overall premise of the book does not focus so much on bugging out from a SHTF situation or smaller scale disaster, but more on an individual need to get out of Dodge for personal reasons. 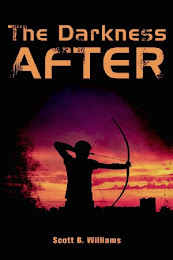 The author cites potential reasons for wanting to disappear into the wilderness - ranging from fleeing a relationship to hiding from Big Brother or even going on the lam from the authorities if you have that need. In his own words: "Quite simply, "wilderness evasion" allows you to drop off the face of the earth for a while." 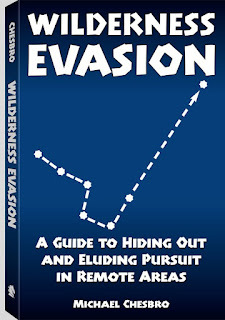 Wilderness Evasion covers the topics you would expect, based on the title. 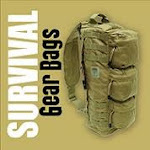 There are chapters on gear, caches, resupply systems, evading pursuit, covert signals, navigation, survival firearms, shelter, camouflage and survival medicine, among others. The only downside to this is that none of these subjects are covered in much depth, and all of them could be expanded on greatly to create a more useful resource. Some of the information is right in line with what I would recommend - such as choosing the "ubiquitous .22" as the best all-around survival firearm. Other areas are greatly over-simplified, for example, there is a chapter on primitive weapons with a brief description of how to make hunting weapons such as a bow and arrow. Having made quite a few primitive bows, I can tell you that it's not something you get from a couple of pages of description, but at least the fact that these kinds of things are in the book is good. Those who are serious about learning all they can about wilderness evasion and living will be able to delve deeper on their own into some of these specific skills. The bibliography in the back lists some good sources for this. The information covered here is broken down into short, easily-digestible tidbits - accompanied by a few lists, sidebars and simple illustrations. While not a one-stop reference to wilderness survival while on the move, it is a book that will get you thinking about these things from a different perspective than the typical "how to survive when lost in the woods" book. Time and tide wait for no man. The Pathfinder keeps track of both, not to mention direction, temperature, altitude, air pressure, and phases of the moon. The Casio Pathfinder series of watches are advanced digital timepieces designed for rugged outdoor use. I recently tested the Pathfinder PAW 1500 model, which is one of the most advanced in the Pathfinder line. The PAW 1500 is a solar-powered, multi-band atomic watch like others in the line, but also features three sensor modes in addition to timekeeping. These extra sensors are the direction sensor digital compass, the pressure sensor barometer and altimeter, and the temperature sensor thermometer. This is an impressive collection of instrumentation in a compact package that fits comfortably on all but the smallest wrists. The timekeeping function offers the accuracy of radio-controlled calibration by receiving time signals transmitted in Germany, the United States, England and Japan. In the U.S. the signal is transmitted from Fort Collins, Colorado. The Pathfinder watch I tested had no problem receiving this calibration signal from my home in Mississippi. The watch adjusts its time automatically at periodic intervals, but I also performed a manual calibration and the signal was received within two to three minutes. Current time is displayed in hours, minutes and seconds. Checking the time over a four-month period against other timepieces and my cell phone, I concluded that the Pathfinder is extremely accurate and would be excellent for navigation purposes. Timekeeping functions also include world time, a countdown timer, a stopwatch, five different daily alarms and a tide graph and moon phase indicator. The moon phase indicator is a graphic display in a small circle at the top left of the main display face that shows the current phase of the moon as viewed from the northern hemisphere. A glance at the indicator tells you which quarter the moon is currently in. The tide graph is naturally a useful function for kayakers. You can set up the tide data based on your selected home city or nearest port city and adjust the tide graph to high tide time at a particular date. After setting this up, the current tide condition is graphically represented, showing the range from high to low and spring tide, intermediate tide and neap tide. My favorite feature of the Pathfinder PAW 1500 is the digital compass. With the push of a button, the main display switches from current time to a digital bearing readout. Turning your arm so that the watch face is horizontal to the horizon allows it to acquire an accurate bearing in just seconds. I was impressed with the accuracy of the compass when I tested it earlier this year while sailing in south Florida. Bearings were compared between the Pathfinder compass and the vessel compass and GPS chartplotter. The Pathfinder compass was consistently within a five-degree margin of error in comparison with the other compasses and was just as quick to acquire new bearings during course changes. The compass can be calibrated manually for magnetic declination and calibrated to match another compass such as a deck compass. The rotary bezel on the watch allows navigation to a precise bearing while keeping the north indicator on the bezel in a position indicating magnetic north. It’s certainly convenient to have an accurate compass right on your wrist at all times, and nice to have the redundancy it provides as a backup to deck mounted compasses and hand-held GPS. The pressure sensor mode of the Pathfinder PAW 1500 allows it to function as a reasonably accurate barometer and altimeter. Like the compass, each of these instruments is accessed with one touch from a dedicated button on the side of the watch. The barometer shows current barometric pressure as well as a graph indicating changes to assist in making predictions. The barometer function has proven useful in monitoring the ever-changing spring weather in my region as low-pressure cells move in every few days, bringing rain followed by dry air high pressure systems. 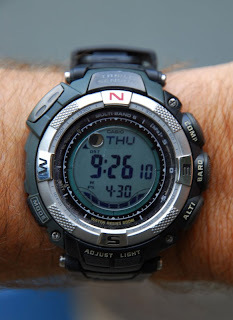 The altimeter function uses a pressure sensor to estimate altitude. Although I haven’t tested the watch very far from sea level, the current reading of 140 feet at my home location is accurate to within 20 feet or so. This altimeter is not intended to be accurate enough for aviation of course, but can be useful to climbers. Sea kayakers aren’t likely to need it anyway. The built-in thermometer is perhaps more useful, and in testing it matched readings on an indoor-outdoor mercury thermometer I had at the house. The thermometer will not function properly, however, when the watch is being worn, as body heat interferes. It has to be removed from the wrist and acclimated to the surroundings for about 20 to 30 minutes to get a true reading. The Casio Pathfinder PAW 1500 not only combines all these instruments in a wearable watch, but does so in a package that is rugged and waterproof to 200 meters. It is rated safe for SCUBA diving at normal depths and is tough enough for hard wear in outdoor activities. I’ve worn my test sample through long days of hard work in the boat shop and in the interior refit of a classic Alden schooner where it was frequently banged against a bulkhead or other solid object and subjected to the dust and vibration of power tools. The watchband is black resin, and is tough, flexible and secure. It features a heavy stainless buckle and a wide range of size adjustment slots. The inner side of the band is grooved in a non-slip pattern so the watch won’t rotate on your wrist when it’s wet or sweaty. The built-in solar powered battery never needs replacing and only requires a small amount of light to keep it charged, especially when the watch is in the power-save mode. A green display light that is easy to see allows nighttime use and can be set up for manual activation or to come on automatically when the watch face is tilted up toward the wearer.